Pauline, who lives in Dunedin, New Zealand, got in touch as they are looking for details about the 1956 caravan that they have recently purchased. It was built by Argosy Coachworks Limited, Wilbury Way, Hitchin in Hertfordshire, the exact model is the Twelve Deluxe and was for sale at £459. 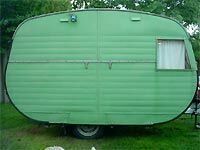 Pauline is keen to contact anyone else who owns one of these caravans, to further her research of how the van would have been when new, original colours used (interior and exterior) and so on. There isn't a great deal of information out there at the moment, so if you can help Pauline in her quest, please get in touch. According to a period leaflet that came with the caravan, Argosy was an associate company of Berkeley, who advised that they were 'the biggest builders of caravans in Europe, and probably the world!'. Obviously modesty was not in short supply back then! 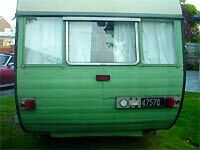 Shown here are some photos of this great old caravan, 'as found'. Thanks for sending this information over, hopefully some more info will come out as a result! 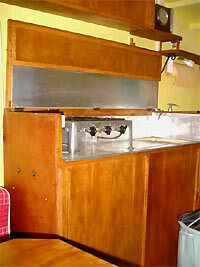 Interest in period caravans is increasing, just as supplies of either good, or restorable, examples dwindle. Caravans, like cars, quickly suffer when they fall out of regular use. The construction of older caravans is usually more substantial than modern vans, simply because proper hardwoods were often used instead of the lightweight materials used on recent caravans. "The interior is actually almost as new, lino, cooker (gas which also runs a gas lamp, as per the pamphlet specification - over the other side of the one on your website) it makes fascinating reading and if I had a scanner I would send it to you, its actually has aluminium exterior panels 20 SWG (? ), timber body framing and internal panels made of 'Celotex" (hopefully this doesn't tramslate to anything toxic!!!) The only thing that has been changed is the colours of the inside walls and the exterior caravan, some updated electrical wiring, plus the addition of one cupboard and a couple of minor shelves. It also has a fourth bunk in the form of a stretcher bed which fits into the wall. We are lucky as this vehicle has a four year electrical validation certificate and is warranted for the road. " Being so well made, many older vans are really quite heavy, so it'd usually be a sturdy motorcar that would be required to haul the 'holiday on wheels' around the countryside. There are a couple of owners clubs that cater for enthusiasts of classic caravanning in the UK. With surviving examples of individual models being few and far between, making contact with others who own a similar van to you makes restoring one to the correct specification that little bit easier. Old magazines are a great source of information, and well worth hunting down. 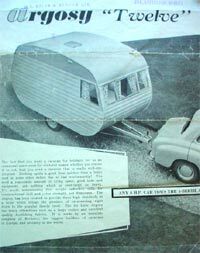 Motoring magazines, such as Autocar and Motor, often ran caravan features, and contained pages of advertisements for makes and models of caravan that have long since slipped into history. For anyone researching a particular brand of van, this can be a good place to start looking for information, especially if your chosen manufacturer is no longer around.